Bingo! Looks like this opens Flickr up more to the folks that like interrupted media such as Twitter. Earlier I had talked about a move by Twitter to expand their Personality Space as well. 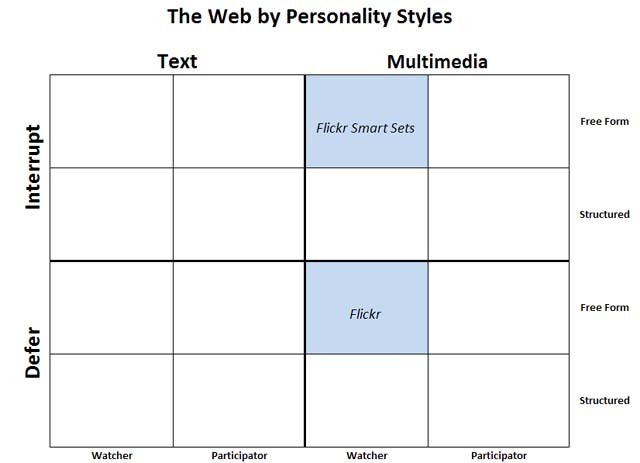 It makes so much sense to think about the Web 2.0 as having a Personality Space. If you want to optimally reach all audiences, you need to cover the space as best you can. The space is real because it’s based on well understood theories about Learning and Communication Styles. Spock broadens their Web 2.0 Personality Space to give Participators something to do. This entry was posted on September 7, 2007 at 6:58 pm	and is filed under Marketing, strategy, user interface, Web 2.0. You can follow any responses to this entry through the RSS 2.0 feed. You can leave a response, or trackback from your own site.